There are a lot of ghost stories in Charleston, South Carolina. The myriad of tour companies offer different tales, and some of them are even exclusive. 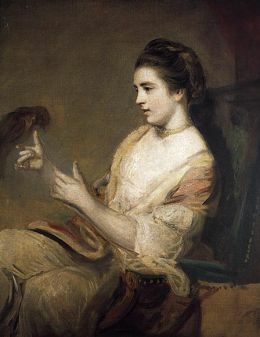 But nearly all of them at least touch on the story of Lavinia Fisher. When you take a ghost tour in Charleston, you might hear slightly different versions of this legend, but everyone seems to agree on the main points. Back in the early 1800s, Lavinia Fisher and her husband, John, operated the Six Mile House, located six miles north of Charleston. There are variations on how they came to run the inn. Some say they were the original owners. Some say they killed the original innkeepers, and squatted. Regardless, it was a place where a weary traveler could stop for the night, get a meal, and rest his horse before continuing to Charleston, Savannah, or wherever he was headed. Lavinia Fisher was stunning. Beautiful raven hair, porcelain skin, and deep, bright blue, mesmerizing eyes,—she knew she was beautiful, and used it to her advantage. Unsuspecting travelers would happen upon the inn, and she’d greet them at the door. She’d smile graciously, with that oh-so-sweet and polite Southern charm. With a soft, slight Lowcountry drawl, she’d invite them in for a good meal and a cozy bed. Her murder weapon was laudanum—in the tea or in the food—and all she had to do was wait. Her guests would soon succumb to the effects of the drug, and her husband would finish them off in their sleep. Any uneasiness Peeples may have felt quickly dissipated when he laid eyes on Lavinia Fisher. She was the most beautiful woman he had ever seen. She smiled and greeted him warmly, offering him tea and stew while he sat and removed his boots. Peeples had never cared for tea, so he poured it out when Lavinia’s back was turned, so as not to offend her. They chatted for a bit, and Peeples was thoroughly enjoying his time with this charming, witty, and beautiful woman. Then, Lavinia began asking the same questions: “Where are you headed? Is anyone expecting you? Does anyone know you’re here?” Peeples began to feel uncomfortable. Soon after, though, John Fisher returned and said he had cleared out a room, if Peeples was still interested in spending the night. Peeples, weary from the road, shrugged off any apprehension he was feeling, and decided to accept the Fishers’ offer. He was shown to his room, set his knapsack on the bed, and changed into his bed clothes. As he sat on the bed, though, he could hear whispers outside his door. Again, he felt uneasy, so he got up from the bed, and sat in a chair near the door. He was nearly asleep when a sudden loud crash startled him awake. He opened his eyes to find that the bed had disappeared. Having been mounted to a trap door, it had swung down, dumping his knapsack into a pit below. He jumped out of his chair, and ran over to the giant opening in the floor. He stared down into the pit…right into the eyes of a knife-wielding John Fisher. John Peeples ran from the house, jumped on his horse, and rode the six miles to Charleston, still in his bed clothes. The next day, Sheriff’s Deputies rode out to the Six Mile House. They searched the property, and after finding several bodies, arrested John and Lavinia Fisher. The Fishers remained in the Old City Jail and awaited trial and, if convicted, sentencing. No one knows how many people were killed by the Fishers. Even John Fisher, who confessed to the crimes, said he’d “lost count” after 15 or 20. But by February, 1820, John and Lavinia Fisher had been convicted, and sentenced to hang. They had unsuccessfully appealed for clemency, a fact that Lavinia could not believe. She was a beautiful woman, after all, and she knew that no man could resist her. She thought there was no way they would actually execute her. In South Carolina during that time, a married woman could not be executed. But they could execute a widow. So, that was an easy fix–John Fisher was executed first. Lavinia was afforded a last request however, and she easily and arrogantly decided to be hanged in her wedding dress. This execution was public, and thousands were gathered at the gallows to witness it. She was convinced that once those men saw her in her wedding gown, someone would halt the execution by taking pity on her and proposing marriage. When she finally realized that no one would intervene, she began to laugh maniacally. As the noose was placed around her neck, she called to the crowd, “If anyone has a message for the devil, give it to me! For I shall see him soon!” And with that, she jumped off of the platform, strangling to death. 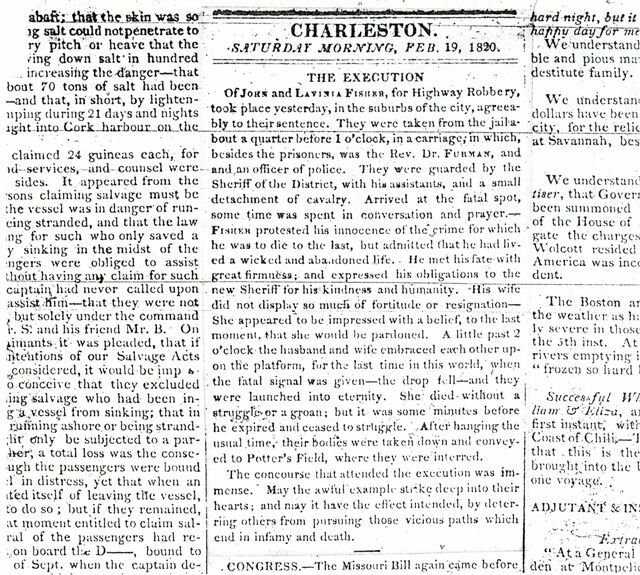 Some Charlestonians believe that the official record has been sanitized for posterity, such as in the execution notice below. But ask any local about Lavinia Fisher, and you’ll probably hear the legendary version. In this case, it seems that folklore has prevailed. Even if it’s not entirely true, it sure makes for a great story. The Six Mile House was located at what is now the corner of Rivers Avenue and Dorchester Road. The Fishers were buried in a potter’s field where the Medical University of South Carolina now stands on Ashley Avenue. There’s not much to see in either place. 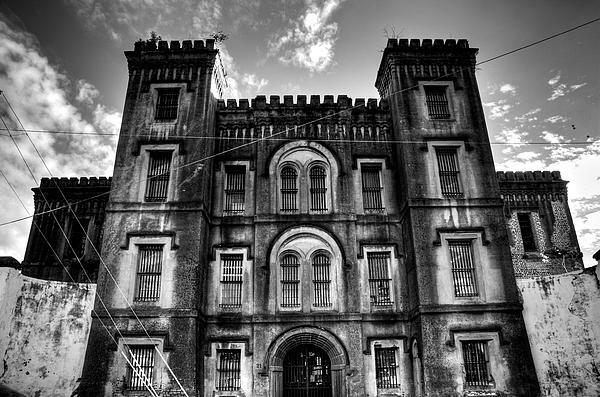 But the Charleston Old City Jail, where Lavinia and John Fisher were kept until their executions, still stands. It’s a harrowing place, and has been investigated by various ghost hunters over the years. Only one tour company can get you in there, so if you want to see it, contact Bulldog Tours. I’ve been told over and over that Lavinia haunts the jail even now. On the tour, ladies are encouraged to cover or remove their jewelry. Apparently, Lavinia likes things that sparkle. Zak Bagans, Nick Groff and Aaron Goodwin of the Travel Channel’s Ghost Adventures investigated the jail in the Fall of 2011, and “spoke” to Lavinia. Wanna see some highlights? ~ by scareschs on March 7, 2012. Check out the About page for author info. Good luck with your project! Happy to help, Aya. For a different perspective on the old legend, pick up a copy of Bruce Orr’s Six Miles to Charleston: The True Story of John and Lavinia Fisher. Good luck with your project! Crazy, indeed. It’s also interesting hearing the various ghost hunters’ interpretations of these alleged hauntings. Check out Charleston when you get a chance. The stories there are fascinating. In the meantime, you could also investigate Ghost Tour of Philadelphia. Good luck!